On September 21, 2017, Ambassador Liu Xiaoming met at the Embassy with the delegation led by Carrie Lam Cheng Yuet-ngor, Chief Executive of Hong Kong Special Administrative Region (HKSAR) during their visit in the UK. Ambassador Liu extended his warm welcome to the visiting delegation led by the Chief Executive, noting that this year is the 20th anniversary of Hong Kong's return to China. Over the past 20 years, Hong Kong has obtained remarkable achievement that is recognized across the world. Hong Kong has been playing an important role as a bridge and a bond between China and the UK. The Chinese Embassy will, as always, support HKSAR Government and Hong Kong Economic and Trade Office in London to expand the exchanges and cooperation with the UK enthusiastically. 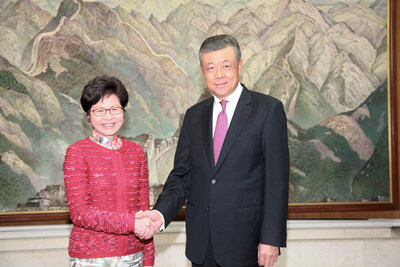 He is convinced that under the leadership of the Chief Executive and the new SAR government, Hong Kong will continue to maintain its prosperity and stability to write a more brilliant chapter in the future. 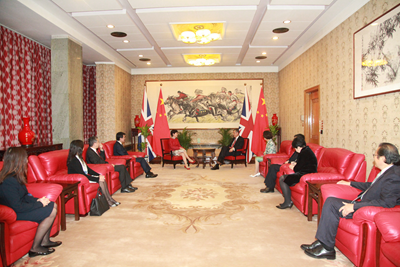 The Chief Executive said that her extensive contacts with people from the British government, parliament, business and cultural sector during the visit had increased the understanding of Hong Kong by British people from all walks of life and promoted practical cooperation between Hong Kong and the UK in various fields. Looking into the future, with the strong backing of the motherland, Hong Kong would seize the opportunities brought by the Belt and Road Initiative and the construction of the Guangdong-Hong Kong-Macao Big Bay Area to give full play to its unique strength and to explore and innovate in order to create a more promising future.